I am so excited. I’ve done the research, taken classes and worked with experts around the globe – and now I’m ready to share what I’ve learned. 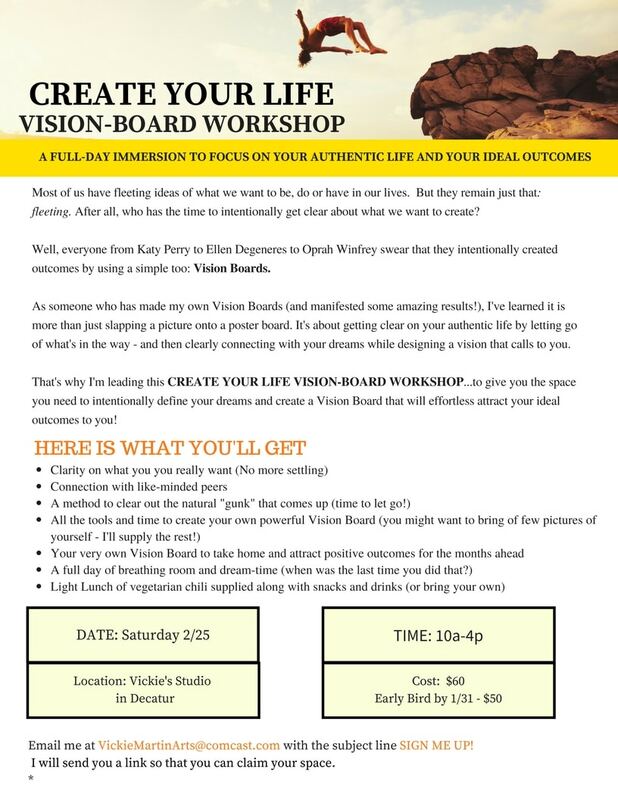 A VISION BOARD WORKSHOP! So, why doesn’t everybody do them? In my experience as a life coach and artist, I find people just don’t take the time. Or maybe they are just skeptical. But, it is time to change that! With this workshop, I will send you a “Create Your Best Life” Dream Sheet to fill out prior to the workshop to get clearer on what you want in your life. 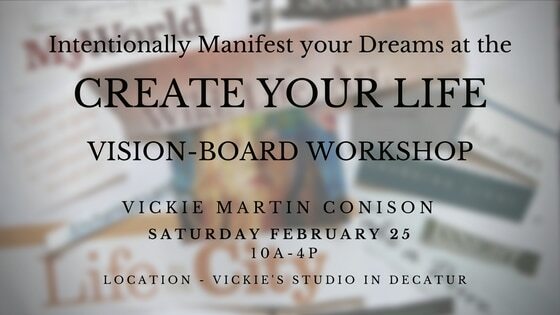 After completing the workshop, not only will you leave with a finished vision board, but you will leave with other tools such as a booklet that will include the “Be-Do-Have Worksheet”, a hand out on the importance of having a Word of the Year, and other things (working on several ideas). Are you ready? Doubts, excuses and wavering are just the ego’s way of stopping you from creating your dream! If you sign up prior to February 1, you will get the early bird discount of $50. To sign up email me here and I will send you an invoice. Also, don’t hesitate to ask questions. Because of the powerful work in our day together, there are only a few spaces available. They will fill up quickly, so please act quickly. Your space will be confirmed with payment is received. This entry was posted in Around Atlanta, VICKIE MARTIN ART, vision-board workshop on January 17, 2017 by vickiemartin.